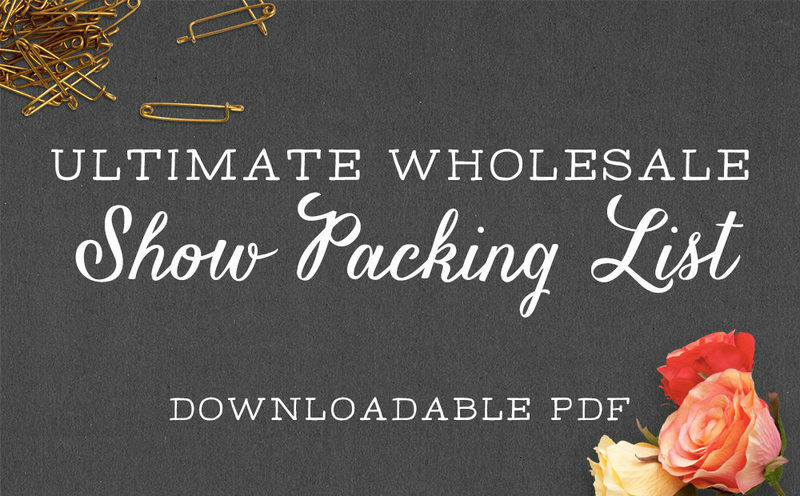 This is a guest post from Emily from Wholesale In a Box. More info on them below. Jeanie’s hand-painted, wooden necklaces are gorgeous, quirky, and fierce. When Jeanie started working with us at Wholesale In a Box, she had 3 stockists but wanted to grow her wholesale business. So I asked Jeanie to send me all the materials she’s been using to reach out to stores. When I opened her line sheet, the problem was clear right away. She simply wasn’t representing her work well in it. So, over a weekend, we threw ourselves into improving her line sheet from cover to cover. And within two months, she got 4 new store accounts. She knew that if she continued like that, within a year, she’d be able to quit her day job. Jeanie was thrilled and so were we, but her story isn’t unusual. We’ve worked with more than 250 makers at Wholesale In a Box and the truth is that for 9 out of 10 makers, their line sheet is a major obstacle to wholesale growth. Of course, a unique and high-quality product is the most important thing for any handmade line. But all else equal, makers who have 80+ stockists tend to have a much more polished, passionate, beautiful line sheet than those who struggle to grow their wholesale accounts. The good news is that the gap between a line sheet that is in the top 5% and one that is in the bottom 95% isn’t impossible to bridge. It just means investing a bit of time in refining your line sheet and avoiding some key mistakes. 1) Using the same kind of line sheet for every wholesale strategy. If you are reaching out directly to stores, your line sheet isn’t just a line sheet—it’s the entire representation of your business, in a single document. If you’re going to trade shows, then your line sheet can be a more traditional rundown of your products, without bearing so much responsibility for selling the line (since the buyer visits your booth). In each case, the line sheet is doing different jobs. With your wholesale strategy in mind, consider what job you need the line sheet to do—Sell? Convince? Remind? Provide details?—then tailor its structure and content to do that job as well as it can. 2) Not telling your story well. Use a writing style that is authentic to how you really speak. Make sure your photos’ aesthetic matches your line’s aesthetic. Describe your products and process in a way that draws out what is unique about them. Craft a bio that is concise but illuminating. Come out from behind the camera and show yourself in the studio. Don’t settle for photos that are subpar in lighting, clarity, and composition. Do include a handful of model or in-context shots of your line, in addition to the product-by-product photos. Do ensure that the aesthetics of your photos and props “read” the same as your line’s aesthetic. 5) Being unclear and confusing. What the front, back, inside, outside, and sides of each product looks like. How much each item costs wholesale, how much the store can charge retail, and what your payment, shipping, and turnaround terms are. What each product is made out of and how the production process is the same or different across the line. Which product name/number goes with which. How things will be packaged and/or arrive at the store. 6) Not putting yourself in the store owner’s shoes. What is new, exciting, and meaningful about this product? How is it different from everything else I see? Who will buy this and how will they use it? How am I going to display these products in a way that will sell? 7) Making the store owner work for it. Don’t send her a 100 MB attachment that will crash her email. Don’t make her sign up for something or create an account to see your wholesale line. Do make sure there is an obvious, simple way to place an order. Thanks for this great article! I was under the impression that my line sheet should only be a 1-page PDF, but it sounds like that’s not the case? If I read this correctly, my “line sheet” can be multiple pages and include photos, my brand story, etc- along with the product info and ordering info? If so, how many pages maximum do you recommend? And, any chance someone has a sample line sheet to share? Thank you! What is the best way for buyers to place an order? I usually have them just email me a list of the pieces and quantity that they want to buy because an order form would be extremely long. Hi Katie! For placing orders, there are always a few options… and the options have changed and evolved quite a bit in the past few years! Some makers have a whole wholesale shopping site. Others give buyers a coupon code (to apply the wholesale “discount”) to use on their retail site. Still others have an order form. Honestly, for most makers, having them email you a list is often the best way (especially outside the context of trade shows), until you have several dozen stores you’re selling to consistently. So I’d say you’re good to go! With the closing of Etsy Wholesale, it leaves many of of scrambling. In my research, I keep coming across the advice to not make them log in to see your wholesale offerings. I would love to know why. Many of the wholesale apps and such recommend this on Shopify. I am torn. I would love your opinion. Hey! This is a great question and one that comes up a lot. Different makers have different strategies around this. Many makers feel that having buyers log in creates too high a barrier for them to look at products and prices — it would be like if you had to make an account just to visit your average online store. On the other hand, some makers feel that having their wholesale prices publicly available (even if hidden to the general public by an unlinked shop or page) is too uncomfortable. I generally do recommend making it so wholesale buyers don’t have to log in to see prices (although it depends on the situation.) And just making your wholesale prices/page/shop un-stumble-upon-able by the general public. Hello! Great article, very helpful. Where would you recommend to do my line sheet? In design? and then convert it to a pdf? I have the idea of how to do it but do not know where to do this. I will be sending my line sheet through email. Hey Ana, I recently got a tip from a maker that you can buy line sheet templates from Etsy sellers! Maybe give that a try.